Theodor Gomperz (1832-1912) was Professor of Classical Philology in Vienna and is today primarily known as the author of the three-volume work "Greek Thinkers", which is still astonishingly modern and still can be recommended to read: Since Gomperz was a classical liberal he was well acquainted with the recent scientific developments of his time which still today are the basis of our scientific world view: Evolution, psychology, criticism of religion, ethnology, economy, nuclear physics and astrophysics. Gomperz had personal contact with pioneers of modernity such as Sigmund Freud or Ernst Mach. Picture: Theodor Gomperz medal, 1892. In his work "Greek Thinkers" which was translated into several languages, Gomperz also touched on Plato's Atlantis story which he calls a "historical novel" (Vol. III Chapter XIX pp. 200-207). Contrary to other academics of his time who already believed firmly in the invention of the Atlantis story by Plato, Gomperz assumes that Plato concerning primeval Athens indeed believed himself in his depictions: "Plato believed that he had discovered some of the essential features of his political ideal in the dim beginnings of his native city." The evidences Plato put forward to support this does not serve for deception, according to Gomperz, but are meant seriously. And where Plato embellished the historical tradition, he did not do this arbitrarily, yet he felt bound to the given framework. Since Gomperz does not assume that such a past of Athens really existed, he talks of "self-deception" on behalf of Plato. Only when it comes to Atlantis, Gomperz believes it to be allowed to talk of free inventive fiction, in which Plato himself did not believe: The "over-bold fiction" of Atlantis was due to Plato's pedagogic intentions and his "pleasure of romancing" (German original: "Lust zu fabulieren"). Yet at the end of his discussions of Plato's Atlantis story Gomperz surprisingly opens the doors wide for the possibility that also Atlantis is not a fiction but history – even real history, and not only a "self-deception" like primeval Athens! The reason is that Gomperz believes it to be possible that especially the Sea Peoples wars – of which the ancient Egyptians report – form a historical background for Atlantis. Thus, Gomperz conceded to Atlantis even the possibility to have a historically much better founded background than primeval Athens. And Gomperz conceded, that Plato possibly knew indeed a real historical – of course distorted – tradition from Egypt. 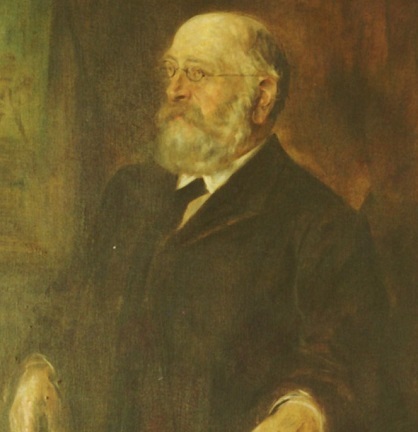 Picture: Theodor Gomperz, painting by Franz von Lenbach, 1900. First, that Plato on the basis of a real historical tradition from Egypt possibly believed in the basic truth of his depictions, not only in the case of primeval Athens but also in the case of Atlantis. Secondly, that there maybe existed for Atlantis – different to primeval Athens – even a real yet of course distorted historical background ("now attested by documentary evidence"), so that Atlantis is possibly no "over-bold fiction" as Gomperz wrote previously. Thirdly, the fact alone that Gomperz clearly realized at least for primeval Athens that Plato believed himself in what he wrote, is a small sensation. Whoever has understood this is only one small step away from the realization that this is of course valid for Atlantis, too. Yet with superficial readers only the impression remains that Plato's Atlantis story is only a "historical novel", composed of "self-deception" und "over-bold fiction". "So in any case: It is not true! ": Thus is the thought of the superficial reader. Yet this is not what Gomperz wrote. Greek Thinkers – A History of Ancient Philosophy, three volumes, translated by Laurie Magnus (1901) and G.G. Berry (1905), published by Charles Scribner's Sons, New York 1901/1905/1905. – German original: Gomperz (1896/1902/1909): Theodor Gomperz, Griechische Denker – Eine Geschichte der antiken Philosophie, 3 Bände, Verlag von Veit & Co., Leipzig 1896/1902/1909. NB: The volumes are divided differently in English and German. Frost (1913): K.T. Frost, The Critias and Minoan Crete, in: The Journal of Hellenic Studies Vol. 33 / 1913; S. 189-206. THE "TIMAEUS" AND THE "CRITIAS." 1. An historical novel and a scientific fairy tale - it is thus that we may describe the content of these two dialogues, without breach of the reverence due to Plato. A considerable time after the completion of the "Republic," its author gathered up the threads he had allowed to drop, and set about increasing by an extension a work which was already of no mean magnitude. The same endeavour after systematic completeness, shown in the expansion of a work originally created without any thought of continuation, is manifest here as in the continuation of the "Theaetetus." The analogy goes further. In both cases Plato planned a tetralogy of which the last member is lacking in the execution. In the present case the performance has lagged still further behind the intention, for even the third part of the trilogy the "Critias" remained incomplete; in fact, it breaks off in the middle of a sentence. The "Timaeus" and the "Critias" are cemented to the "Republic" by their matter, but not by their form. New characters appear in the dialogue: besides Isocrates, there is the Timaeus who gives his name to the first of these two dialogues, a citizen and statesman of Locri, in Lower Italy, a man here praised for his philosophic training, and almost certainly a personal friend of Plato's. The latter makes him the mouthpiece of his own theories of nature, possibly as an expression of gratitude to Timaeus himself and other representatives of the Pythagorean school. The third character, who is also the chief speaker in the second dialogue, which is named after him, is Plato's highlyesteemed great-uncle, the Critias who is already well known to the reader (cf. Vol. II. pp. 250, 301); the fourth is Hermocrates, who was intended to be the chief speaker in the fourth dialogue bearing his name, like which he is for us a mere shadow. With these persons Socrates states that he has had a conversation on the previous day, and the substance of this is recapitulated in the opening portion of the "Timaeus." To a great extent, but by no means completely, it coincides with the matter contained in the "Republic." The material differences, as well as the variation in the persons represented as having taken part in the dialogue, have roused the astonishment of interpreters, and led some of them to hypotheses which we regard as adventurous. The two circumstances, as we believe, may be satisfactorily explained by reference to the objects which guided Plato in the composition of the "Timaeus" and the "Critias." The author of the "Republic" was not spared the reproach of having designed a Utopia, an unattainable ideal of the State and of society. An echo of this complaint, which for the rest is very intelligible, reaches us in the criticism to which Aristotle subjected the work of his master (cf. p. 119). There was another reproach, too, of which we learn from Crantor, a pupil of one of Plato's pupils, and the oldest commentator on the "Timaeus:" Plato was accused of being unfaithful to the traditions of his native land, and of going to school to the Egyptians - a criticism which was doubtless made with an eye to the caste-like organization of Plato's pattern State. To these accusations coming from without there was certainly added a feeling of uneasiness in Plato's own breast. A scion of an ancient and noble house, a descendant of Attic kings, could not be content with the rôle of subversive innovator and quibbling sophist, which his projects of political reform had led Isocrates to attribute to him (cf. p. 27). To this chorus of accusing voices he answered by a narrative which was intended to turn the edge of these reproaches, and at the same time offer signal satisfaction to his own feelings of affection for a fatherland which he had so often felt himself compelled to censure. Truth and fiction were blended in this narrative; but the fiction was not wholly arbitrary, and a considerable measure of self-deception preceded the deception practised on others. Plato believed that he had discovered some of the essential features of his political ideal in the dim beginnings of his native city. We have already had more than one occasion to note the shiftings of his historical perspective; and we have seen how he came, half involuntarily, to find the image of the future mirrored in the past (cf. pp. 91 and 108). Inspired by this belief, he found in the facts of history, or in what were commonly accepted as such, a point of support for the true myth-forming faculty, which colours, supplements, and elaborates the half-known in accordance with emotional needs. Plato's "guardians" - that ruling class freed from all petty cares and ignoble aspirations, extending their fatherly guidance and protection to the great mass of the people - were by no means unlike a genuine aristocracy, especially that transfigured image of it which is cherished in the traditions of old and noble families. The similarity was heightened in the mind of one who credited the whole of primitive Greece with those customs and institutions of Sparta which inclined towards practical communism, and transferred them to the soil of prehistoric Athens. Even the caste-like separation of classes was not quite without its precedent in this latter quarter. There was at the least a widespread belief that in former ages such a sharply marked division had existed. Thus Aristotle, in his "Constitution of the Athenians," speaks of three classes: the Eupatridae, or nobles; the agricultural peasants; and the artisans - three sections of the people, each with its own political rights and its proportion of votes in the election of the ten archons. Even so rash an innovation as the emancipation of women was not necessarily, for Plato, a product of the Socratic "thinking-shop," as Aristophanes called it; not "Cloud-cuckoo-town," but the Athens of his ancestors, was, in his belief, the original home of this practice. The guardian goddess of the city, "Athene the Defender," who with shield and spear kept watch on the height of the Acropolis, was in this instance the guarantor of his faith. She supplied him with a proof that at one time "the business of war had been the common concern of men and women;" and if this were the case with that most unfeminine of occupations, why not with all others? Two inferences follow from what has just been said. In the recapitulation of his political ideals with which Plato prefaces his parallels from prehistoric Athens, those features are necessarily absent of whose existence in the primitive age he could persuade neither himself nor his readers. He was thus obliged to break off that recapitulation at the point where he would otherwise have touched on the scientific education of the "guardians," their crowning study of dialectic, the theory of knowledge by which all those requirements were justified and invested with a deeper meaning. Secondly, the participants in the present dialogue, and therefore also in the earlier one, represented as having preceded it, were necessarily different from those of the "Republic," and such as were better suited to the purposes of the continuation. Thus, in particular, Plato's younger brothers, Glaucon and Adeimantus, are replaced by his great-uncle Critias, the representative of an earlier generation, who repeats his tale of prehistoric Athens as having been told him in his early boyhood by his aged grandfather. The latter, who was also named Critias, had in his turn heard it from a close friend of his father Dropides, the far-travelled and historically learned legislator and poet Solon. 2. The quasi-historical verification is accompanied by a quasi-experimental one - a strange proceeding, which it is not too easy for us to understand. Immediately after the recapitulation to which we have alluded, Socrates lets fall the remark that he feels like a man looking at a fine painting; he is seized, as such a man might be, with a longing to see the figures on which he has been feasting his gaze - not only at rest, but in active motion. He would like to hear of the conflicts sustained by the pattern State of its relations with other states, of the famous actions performed by its citizens. This is the cue for which Critias is waiting, in order to regale his audience with the narrative once told by Solon, on the authority of Egyptian priests and by them derived from the study of primaeval records. Here begins the marvellous tale of the citizens of Athens in the dim prehistoric age. Plato is not content with attributing to his own and his fellow-citizens' forefathers institutions resembling in essentials those devised by himself in the "Republic;" nor does he rest satisfied when he has repelled the charge of "Egypticizing" by making the Egyptians themselves the borrowers. He goes on to recount the great deeds of those Athenian forefathers, more particularly their wonderful victory, gained nine thousand years ago, over the inhabitants of Atlantis, an island in the Western sea which had afterwards sunk beneath the surface. The narrative is begun in the "Timasus," and continued in the "Critias," but not concluded. What, we are inclined to ask, was Plato's purpose in this over-bold fiction? No doubt the pleasure of romancing was in itself no small allurement to the poet-philosopher; in his later period he was no longer satisfied, as when he wrote the "Symposium," the "Phaedrus," the "Gorgias," or the "Protagoras," with the opportunities afforded him in the construction of the dialogue, in the word-painting of the scenery, in the richly coloured characterization of the dramatis personae, in the alternation of highly diversified styles of discourse. We can well understand that this particular tendency of Plato's mind has now carved out a separate channel for itself, and become an independent element in his work. But while we may have here discovered a predisposing cause, the true ground and motive of his puzzling procedure is still to seek. Not even in the days of his old age did Plato become a mere teller of stories. Behind his romancing we have most certainly to look for a didactic purpose; and the nature of it is indicated to us in no uncertain manner by the wish of Socrates to see the ideal figures of the "Republic" set, as it were, in motion. The viability of these figures had been called in question; objections had been raised, both by others and in Plato's mind (cf. p. 128), against the practicability and salutary operation of the Platonic projects. These doubts it was necessary to overcome; and the weapon of fiction seemed more effective for the purpose than the mere parallelism with the above-mentioned institutions. The paradox is not so great as it sounds; an analogous case in modern literature will serve as an illustration. A highly gifted French novelist of the nineteenth century states very seriously, in his "Experimental Novel," his conviction that by the long series of his own fictitious narratives he has done more for the progress of psychology than is generally accomplished by any one acute and profound observer of human nature. He believes that in the rigorously consistent deduction of action from character, the latter an assumed datum based on "human documents," he has performed a truly scientific operation, closely akin to the experiments conducted by the student of nature. Plato, we imagine, entertained a precisely similar purpose. Deceiving himself by a process which is as intelligible in the one case as in the other, he overlooked the arbitrary element which must necessarily cleave to his description under the best of circumstances. In his continuation of the "Critias" he would certainly have honestly endeavoured to depict characters and actions such as would necessarily arise out of the assumed situation, that is, from the institutions and educational system of the ideal State, supposed realized. He would have claimed the ideal beauty of the characters and the excellence of the actions as witnesses to the soundness of the projected institutions, the worthiness of the ends proposed for pursuit, and the efficacy of the means recommended for their attainment. In other words, he would have laid upon the shoulders of his fiction that task which the student of nature performs when he verifies experimentally the result of a theoretical deduction. Plato abandoned the undertaking when barely begun. For this we need assign no other reason than that the genuine scientific spirit was after all too strong in him; that though he might project, he could not carry out a plan founded on so grievous a self-deception without becoming aware of its illusory character. Thus what we have before us is not the edifice as the architect designed it, but only the vestibule by which it was to be approached: the description of that mighty empire which was founded by Poseidon and ruled by his posterity, ten allied kings in each generation - an empire which surpassed all regions of the earth in the excellence of its climate and the fruitfulness of its soil, in its abundance of precious metals, in the magnificence of its aqueducts and the splendour of its temples and palaces - an empire whose power extended over an island larger than Africa and Asia taken together, over other islands lying beyond it, and over parts of the Western Continent itself, which by force of arms had pushed its authority as far as the borders of Egypt in Africa and those of Italy in Europe. We should be glad to know how far Plato's fiction is based on popular legend; how far the belief in an extensive country in the West rests on the presupposition of a not wholly unsymmetrical distribution of land between the Eastern and Western hemispheres; how far the fact, now attested by documentary evidence, of an incursion into Libya and Egypt made by conquering "sea-nations" coming from the West. But on all these points we are left to uncertain conjecture. 3. Be that as it may, the historical romance merely supplies a framework for Plato's theories of nature. To give an account of these is not the most delectable of tasks. Their fruitfulness stands in inverse ratio to their obscurity. The contents of the "Timaeus" have always been regarded as enigmatic; so much so, that the controversy over their interpretation began in the second generation of the Platonic school, and has lasted down to the present day. It was not till late in life that the philosopher approached the investigation of nature; this part of his system was therefore subjoined by way of appendix to the "Republic," a work already complete in itself, in which all the other divisions of his philosophy were contained. Even then the study of nature was for him, as he tells us expressly, a labour of secondary importance, a kind of pastime. The limitations of Plato's endowment are here plainly discernible, and it is still more evident that by his disdain of the most effective means of pursuing these inquiries, he has closed against himself the paths which might have led to valuable results. Indeed, this antagonism to the experimental method is even more pronounced in the "Timaeus" than in the "Republic ;" what he had ridiculed in the earlier dialogue (cf. pp. 84, 85, and 187) he condemns in the later. Alluding to an experiment, probably conducted by atomists, and bearing on a question in the theory of colour, he describes such procedure as a trespassing on the divine domain, as rebellious presumption of the human intellect. Thus the most important auxiliary in the investigation of nature is no longer merely disdained, but proscribed as an impiety. From the romance of "Atlantis," Plato passes to his theories of nature by a transition which is external in character and not a little violent. The narrative must not proceed, he says, till the origin of man has been described, and this presupposes the origin of the world. But the bond by which these two parts of the work were connected in the author's mind was much closer and stronger. It was from the nature of justice that the investigation in the "Republic" had set out; in the "Timaeus" he returns to the same point by a wide circuit. He supplies ethics with a cosmic foundation. The whole of nature is "ethicized," and in the following manner. The analogy between individual and State is no longer sufficient for the broadened range of Plato's thought; it is expanded into an analogy between man and the universe. Justice, as the reader will remember, had been defined as the right relation among the different parts of the soul. To this there corresponded the right relation among the three classes of the ideal State. But Plato's survey is now immeasurably enlarged. The threefold division is now extended to the world-soul; and on the due proportion of its three parts, the continuance of the universe is made to depend. Theodor Gomperz, Greek Thinkers, Volume 3, 1905, Chapter XIX, pp. 200-207. German original edition: Griechische Denker, Vol. 2, 1902, pp. 464-470.